We visited Dolly Parton’s Dixie Stampede Dinner Attraction in Branson, Missouri. The massive building is home to 32 magnificent horses, the Carriage Room pre-show theater, and a 35,000 square foot main theater. The show is filled with non-stop horse riding stunts, wild west segments, music and comedy. The entertainment begins even before you enter the building. One the way between the parking lot and the front door is a stable filled with 32 magnificent Quarter Horses, Palominos, Appaloosas and Paint breeds. You can see the horses, take a photo or even pet them! After viewing the horses, you’ll enjoy an opening act in the Carriage Room theater. On our visit, the pre-show / opening act was a comedian / magician / juggler. 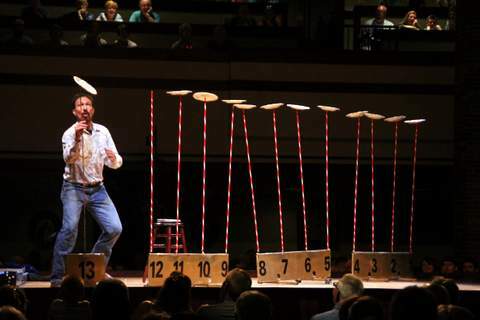 The audience laughed at his jokes as he spun plates, juggled tennis rackets, juggled fire sticks, and performed impossible balancing skills with a ladder. there’s a star-spangled finale with a string salute to the American flag. Dolly Parton even makes a virtual appearance on the 12.5 million LED special effects wall.